This tourism hashtag describes the attitude of most Lebanese I met. They may not have the perfect lives, but they sure are proud of their country and are very welcoming. They are the warmest Middle Easterners I have come across (and no, it is not because of their location off the Mediterranean Seas because I went to Israel last December and it was not the same). I came across many educated and cultured Lebanese. Most of the younger generations speak three languages minimum (Arabic, French, and English). The women are very well-groomed and attractive (they remind me of Venezuelan Miss Universe). The food culture is not bad either! Given the turbulent history of Lebanon especially during the civil war of 1975-1990 and Israel’s attack on South Lebanon in 2006, it is no wonder that the Lebanese are resilient and they know how to live life to the fullest. The Friday before I arrived, the Lebanese Army started an attack on a group of terrorists in an area called Aarsal, which is about 37 km from Baalbeck. 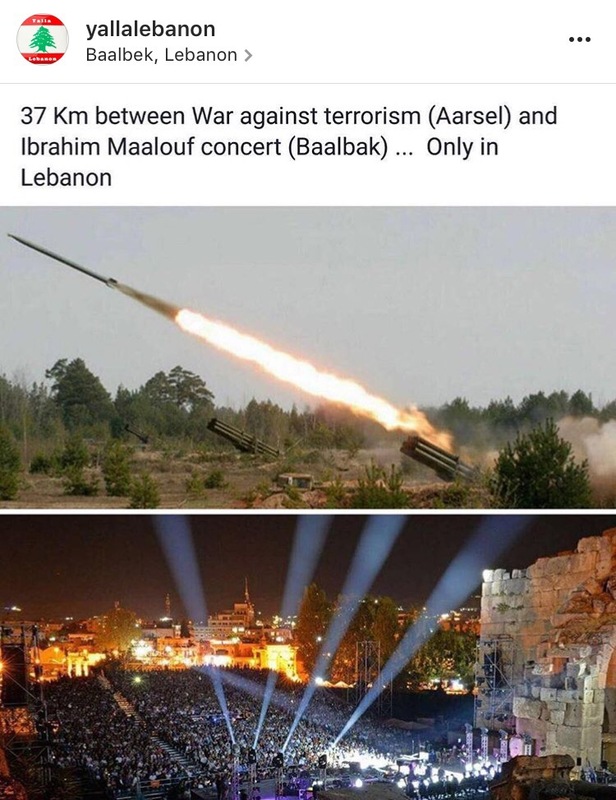 On Saturday, Ibrahim Maalouf performed in Baalbeck as part of Baalbeck International Festival, while the attacks were still going on. This picture has been passed on by many and it says it all. I am glad I read the negative travel advisories on Lebanon (especially on Baalbeck) and disregarded them. Baalbeck is 40km from Damascus and 12km from the Syrian border. We passed many army check points on our way. I, myself, went to Baalbeck on the Monday with no issues. The attack lasted until Wednesday. I felt safe at all times. Do not miss Lebanon from your world exploration. Of course, always exercise common sense and check the latest news before your trip. But to miss knowing Lebanon completely will be a big loss. Posts on my itinerary are coming up.